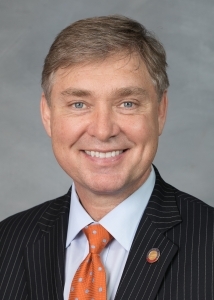 Rep. Duane Hall (D-Wake), a Raleigh attorney, has taken the helm of the North Carolina Courts Commission. The three-term lawmaker was first appointed to the committee in 2013 and has served as a member since then. He was appointed chair of the Commission on Oct. 18 by Gov. Roy Cooper and replaces Rep. Sarah Stevens (R-Surry, Wilkes). Hall said in a Wednesday phone interview that he was “extremely excited” about the appointment, noting that most of the bills he championed over the last year came out of the Courts Commission with bipartisan support. He also credited Stevens for “doing a very good job” with the body and said he wanted to keep things running smoothly with bipartisan participation. The 29-member Commission is tasked with evaluating changes to the state’s court system and making recommendations to the General Assembly. Hall said he is working on trying to schedule the first meeting under his leadership for Dec. 8. When asked if the thought the Commission would play a big role moving forward as lawmakers target the independence of the judiciary, Hall said the body is still discussing it. He said said the members he has heard from are split about whether or not they want to address lawmakers’ efforts to change the courts. “If we think we can successfully bring something out of there, we will,” he said. One of the big topics of of judicial “reform” among lawmakers has been merit selection. Hall said he has not seen any merit selection plans, and that the Commission has never fully studied it because polls show that people want to elect their judges. “It will be brought back up,” he said, adding though that he did not know if it would be studied. Members of the committee include lawmakers, judges, attorneys and academics. They are: Gale Adams, Pam Barlow, Tamara Barringer, Locke Bell, Justin Brackett, Athena Brooks, Tiffany Cone, Joseph Crosswhite, Warren Daniel, Eugene Flood Jr., Stephen Fowler, Lorrin Freeman, J. Patrick Haywood, Barbara Jackson, Darren Jackson, Joe John, Timothy Lea, Robert Kemp III, Michael Lee, Wesley Meredith, Regina Parker, Charles Post Jr., Tonya Bunn Powell, Lauren Raynor, Tanner Robinson, David Rogers, Donna Stroud, Marion Warren and Thomas West.